The range of Numax motorsport batteries bring together a winning combination of leading edge technology, robust design and precision engineering for Motorcycle, Off-road (ATV Quad & Snow ski) and Jet Ski applications. Numax motorsport batteries exceptional built in qualities make this range of batteries the power source of choice for bike owners and motorsports participators. Exceptional starting power up to 30% more than traditional batteries. Robust design making batteries vibration and shock proof. High resilience to deep and repeated discharge. Long-life built into every battery. 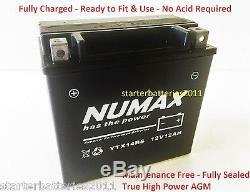 "We are Numax Batteries Official Stockiest in UK". Fully Charged Ready to Fit & Use - No Acid Required. True High-Power AGM Technology - TOP end quality battery. (Height is including Terminals / Posts). Against Manufacturing Faults & Defects. Motorcycle Battery Care & Maintenance. Motorcycle batteries are manufactured to the very highest of standards, but to get the very best performance and longevity out of your batteries it is well worth following a simple care and maintenance program. Always recharge your battery fully if discharged and keep it as fully charged as possible during long periods of in-activity. Please must use Continual Automatic Smart Battery Chargers with these batteries such as NOCO G3200 which is Fully Automatic Intelligent Connect & Forget Mains Powered Smart Battery charger can be left attached to the battery for long periods and will look after your battery at correct state of charge until you need it next. Avoid completely discharging your battery (Below 10.5V) as this will reduce its lifespan. When the battery is out of the motorcycle etc. Always store it in a cool, dry and well ventilated place. From time to time make sure the terminals are free from dust and dirt, and all connections are sound. Please must not use the trickle charger, split charging system and solar charger to charge deeply. Only use mains powered battery chargers. All batteries, regardless of their chemistry, will self-discharge. The rate of self-discharge for lead acid batteries depends on the storage or operating temperature. At a temperature of 80 degrees F.
A lead acid battery will self-discharge at a rate of approximately 4% a week. Keeping this in mind if a 125 AH battery is stored for four months (16 weeks) winter without being charged, it will lose 80 amps of its 125-amp capacity. It will also have severe sulfation, which causes additional loss of capacity. Keep your batteries charged while not in use. You can collect if you prefer. Our Courier Company always tries to deliver the parcel twice only after that you have contact them to arrange the collection within three days of second attempt and collect your parcel from their nearest depot to your home otherwise they will send the parcel back to us. We dont do WEEKENDS DELIVERIES. Please note the advice given from Starter Batteries customer services regarding suitable products should be treated as a guide only. If goods prove to be damaged, do not sign. All Batteries warranted against premature failure due to manufacturing or material defects only. Warning:-Remove bungs (plugs) immediately after receiving the battery or batteries (All types of flooded lead acid batteries) even in storage condition. Bungs (Plugs) are only for transportation use. If these instructions are not followed(removing bungs immediately) battery may get bulged or explode. Or where life is on RISK. INHALATION - Remove from exposure, rest and keep warm. If electrolyte has been swallowed, give water to drink immediately. BURNS - Apply sterile bandage. The item "Numax YTX14-BS TRIUMPH Daytona 955i, Sprint ST RS 99-04 AGM/Gel Upgrade Battery" is in sale since Thursday, April 26, 2018. This item is in the category "Vehicle Parts & Accessories\Motorcycle Accessories\Security\Other Security". The seller is "starterbatteries2011" and is located in Glasgow.